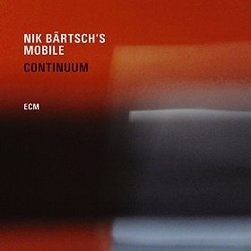 Swiss pianist, keyboardist and composer, Nik Bärtsch has been pursuing his musical ideals and concept that he calls RITUAL GROOVE MUSIC since the original formation of his group MOBILE in 1997, and with his new album Continuum, his fifth for ECM Records, shows just how far his music has progressed and evolved over the last two decades. Focusing his energies on composing and working with his two contrasting groups, MOBILE and RONIN, Bärtsch has created a fascinating sound world that is full of paradoxes and ultimately far greater than the sum of it's parts. In the process he has produced group music that is free of cliché, full of vitality and that functions as a single organism that moves as the music dictates. Working within the dictum that less is more, both units work within music that is based on repetition and reduction yet retain a fluidity of movement that seems an immediate contradiction, as if to break free of their own self-imposed rules and restrictions. The resulting music seems to defy any genre typecasting and spreads its wings in a graceful swoop that encompasses, but is not confined to, jazz, classical music, minimalism, funk, and obviously groove based motifs. Listening again to the RONIN albums recorded for the imprint, and to the reconvened MOBILE on Continuum, it is remarkable how the two seemingly contrasting units approach the compositions, and their relationship with each other, to produce music that is obviously of the same theoretical train of thought yet so different. Within a music that seemingly imposes such stringent and rigid restrictions, there is a sense of unity and purpose for the good of the collective, and yet each individual voice is able to express themselves within the framework of the performance. Solos do not occur in the time honoured tradition of a lone voice out front, but there are solos that are emerge from the fabric of the group sound, very much reminiscent of early Weather Report's statement that "we always solo, and we never solo". It was therefore most enlightening to have the opportunity to talk to Nik Bärtsch about the new album and his musical philosophy. After four albums for ECM with your group RONIN, why did you decide to record with an all acoustic group, and reconvene MOBILE? MOBILE was the initiation of the RITUAL GROOVE MUSIC idea and attitude. I wrote for this ensemble a chamber music piece for my classical piano diploma, based on influences of Bartók, Stravinsky, Reich, Feldman but also Japanese spiritual music and all sorts of ritual groove concepts (for example, David Byrne and Brian Eno’s “My life in the bush of ghosts” is for me also Ritual Groove Music). I wanted to bring together the consciousness of the classical chamber music spirit and modern drumming. The 20th century is for me the century of drumming and drummers – no other instrument made such a jump forward in this time and developed such a power. The second aspect was to melt “quiet” meditative and groove energies in the music. And the third aspect was to explore new concert forms like the long music rituals we have created: to study the basic musical and social energies during performing. The idea was (and still is) to create a direct sensual and smart music based on a group as a musical organism, simple but not simple-minded. When RONIN became more known, we needed a few years to really explore it and make it resonate enough in the musical world. Now was the time to go forward to the roots in our spiral development and to introduce MOBILE again. Can you tell us about your new album, Continuum? Continuum shows our continuous development by presenting for the first time on ECM our all-acoustic group MOBILE which launched the RITUAL GROOVE MUSIC in its beginning at the end of the 90's with long music rituals. The title also has a relation to Ligeti’s piece of the same name. This piece influenced another piece, called Black And White by Swiss composer Edu Haubensak who influenced my Modul 5. Stravinsky once said that a musical piece is nothing else then a comment about another musical piece. But you can find on this record all sorts of continuous lines (probably a lot that I even did not see yet…): also from the original basic MOBILE quartet to the combination with the string quintet, that evolved out of a long process or the natural appearance of a new dedicated musician like Nicolas Stocker on drums and percussion in a very well-rehearsed team. Why did you decide to introduce the string quintet, EXTENDED to the group? In recent years I made interesting experiences with writing for other ensembles because they were interested in playing my music and in the attitude for doing this. I noticed some challenges in the process of translating my musical ideas into a context in which ensembles have a limited amount of time for rehearsing and for creating the consciousness for group organism. This was a delicate and informative process: I had to write rhythmically-easier pieces and also made the experience that the phrasing details and the dramaturgical arches needed a lot of introduction energy (also to avoid scores that had a “Ferneyhough-ish” complexity of detail and to let the interpreters enjoy what they do). So I thought, my need to hear our music in the clothes of a chamber ensemble (respectively of a bonsai big band in case of the Ronin Rhythm Clan) could be explored in an inspiring way with musicians that are interested in a long-term collaboration. Like this we could grow together more with patience and dedication. Team-building processes with focus on a certain goal are usually quiet slow and challenging as we know it also from theatre ensembles and sports. ​MOBILE and RONIN initially appear to occupy a similar musical space, but are in fact very different ensembles. How do you view each of these groups, and how do adapt your approach to composing for them? RONIN is a powerful and poetic dynamo rooted in funk and groove which plays club and festivals. MOBILE is a subtle acoustic equilibrium structure with a chamber music attitude and close connections to the arts which also creates multimedia settings and long music rituals. Some pieces are playable by both ensembles (in different interpretations) but some are very specific, especially of course when there is a strong groove and relation of the bass line and the drum kit (for RONIN). Some pieces like for example MODUL 5, 12 or 4 are written or arranged together more in the spirit of classical modern music but in relation to groove concepts. So although most of the members are playing in both bands, we can express an inspiring difference and different musical needs and worlds with the two ensembles. For all the complexities and detail within your compositions, improvisation plays an important role in your music. How do you incorporate this into your music? Is this approach fairly open or are there predetermined places for variations and ‘solos’ to occur? “Improvisation” is a wide term. We are familiar with various forms of it as individual players but especially for our way of group playing we discovered very fruitful strategies like ghost note nets (ghost notes infect each other), camouflage solos (a soloist behaves like an animal that hides in its environment), colour shadowing (creating team resonances), or several forms or interacting instant composing and groove development interlocking. Or just filling space up with emptiness (doing nothing at the right spot) – the most funny thing. Of course from time to time there is also a “conventional solo”. ﻿As well as the two ensembles, you also perform solo piano concerts. Are these concerts based on through composed pieces or again, is improvisation an integral part of the performance? Both are a necessary condition for my way of playing. But I do not emphasize the separation of both but I am interested in their natural relation. Improvisation is always an inspiring part of playing live. I need to outfox myself to find new perspectives onto the material but also time to listen during the performance to hear new directions that are “self-developing” out of the material. We never have heard all the potential of a musical motive, so in every performance there is unheard music but you need to work on your capacity to listen to it. With my modular way of treating musical material I can create a coherent balance between improvisation and interpretation and the transitions from one into another are fluid. How did you become interested in music and who are your influences? A: Already as a child I felt a strong affinity for rhythms. I tried to drum on everything when I heard music: on the breakfast table, on plates, on my pillow. I also constantly tried some kind of a childlike beat boxing with my mouth. My mother supported my wish to start studying drums seriously at the age of 7. A bit later I saw a boy playing Boogie-Woogie on a piano in the school. I went home and told my mother, that I want to learn this music and the instrument too. Again she supported me and looked for a teacher who could teach this style since at the official music school at that time there were only classical teachers. Music forced and seduced me to start playing and my mother supported and helped me to check this magnetism seriously out. Form e music has the function of god. There are innumerable conscious and unconscious influences of course. But by naming all the famous composers and players we often forget the musicians with whom we play – often life-long. Their influence is very important and sustainably strong. I have played together with drummer Kaspar Rast since we were kids. His playing and the experiences that we made (and still make) together are very important for my idea of rhythm, musical attitude and socio-musical interaction. If we want to follow the line of the modular composers, I can name Stravinsky and Morton Feldman. Stravinsky is also for me the ancestor of modern minimalist music (although its musical strategies of course already were appearing “genetically” much earlier). From the line of improvising pianists, I would like to mention the influence of Ran Blake (reduction, abstraction of the material), Thelonious Monk (the theme oriented and compositional way of improvising) and Joe Zawinul (phrasing between the lines, theme carpets, blurring of improvisation and composition, field dramaturgies). Important non-musical influences are martial arts (mainly Aikido) and drawing: both in the arts (for example, in Paul Klee’s simple drawings) and in comics (mix of image and text and of narrative structure and dramaturgy). What other projects are you currently involved with? I am focussing on my own projects with my groups. We are for example now developing a 27-hour multi-media music ritual with MOBILE for the New York Arts Center in Abu Dhabi – a speciality of this group as I mentioned. And plans for the future? I believe in the spiral development, which means: slowly moving forward to the roots. Nik Bärtsch’s MOBILE EXTENED will be playing at LSO, St Luke’s in London on Saturday 2 July at 2pm, as part of the Nils Frahm’s Possibly Colliding weekend at the Barbican Centre.